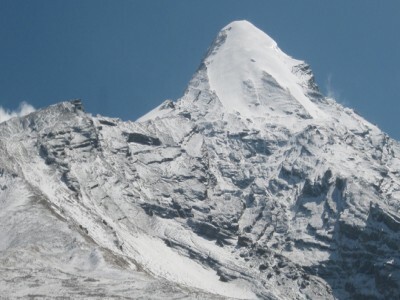 Mardi Himal 5587m/18,330ft is located in the Annapurna region along side the holy mountain of Fishtail or Mt. 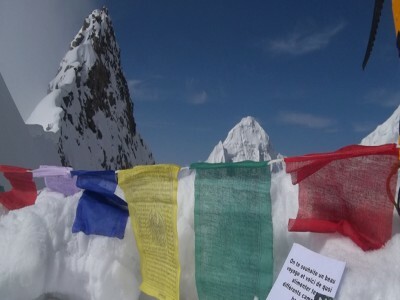 Machhapuchhare. As the crow flies it is less than fifteen miles north of Pokhara. 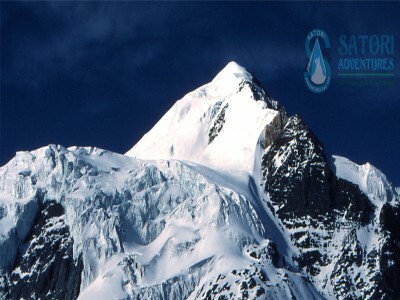 It is the most southerly mountain of the Annapurna range. 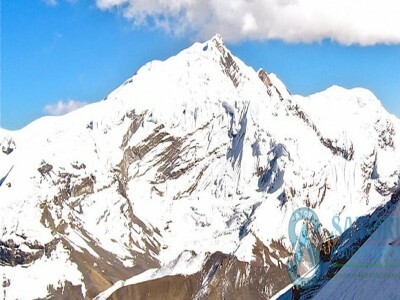 It is the lowest and perhaps the least climbed or visited of the trekking peaks in Nepal.The Mardi Himal Trek is a newly opened route and hidden treasure in the Annapurna region. 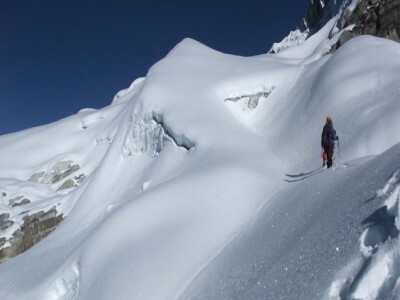 The main climbing route ascends the East face over snow terrain passing a col at 5200m. The caravan route takes you from Kathmandu (1400m/4,600ft) to Lukla (827m/2713ft), then onto Potana (1950m), Forest Camp (2500m/8202ft), Low Camp (2990m/9809ft), and High Camp (3580m/11,745ft), base camp (4450m/14,599ft). 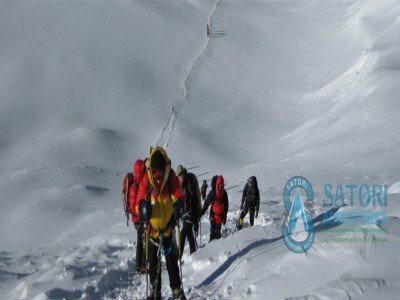 The Annapurna region has a very good reputation for several reasons, it has very simple logistics, a variety of terrain, the treks can start and end in Pokhara (which is a great place to stage an adventure from), easy transportation to the trail heads and you have cell phone network in case of emergencies. 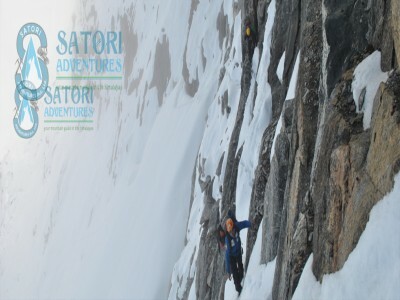 Satori requests that the client has good physical fitness, a list of experience on British hill hikes, several base camp treks and some knowledge of rock & ice climbing. 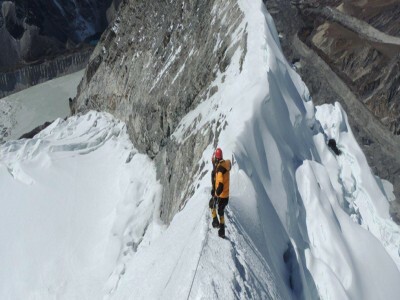 Highest access: 5,553m / 18,219ft. 20 April/Day 02: Preparation and briefings at the departments of tourism. Last minute shopping. 21 April/Day 03: Drive or fly from Kathmandu to Pokhara (915m/3002ft.) which takes about seven hours by bus and 25 minutes by flight. Overnight at hotel accommodation. 22 April/Day 04: Drive from Pokhara to Khoramukh and Trek to Lwang (1100m/36081.ft)-01hhrs Drive and 02hrs trekking, lodge accommodation. 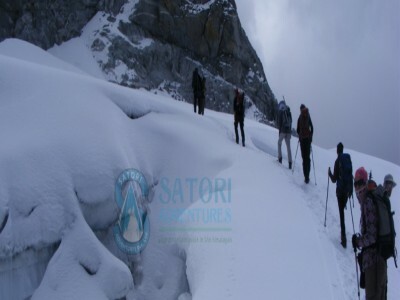 23 April/Day 05:Trek from Lwang to Siding (1,280m/4200ft,)-04 hrs lodge accommodation. 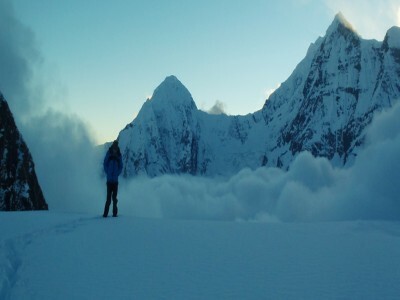 24 April/Day 06:Trek from Siding to Low camp (3,150m/10335ft. )- 04hrs Lodge accommodation. 25 April/Day 07: Rest and Acclimatization day before climbing above 4000m elevation. 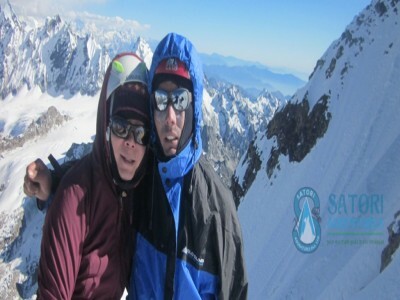 26 April/Day 08:Trek from Low camp to Mardi Himal Base camp (4,500m/14763ft)-04hrs overnight at camping accommodation. 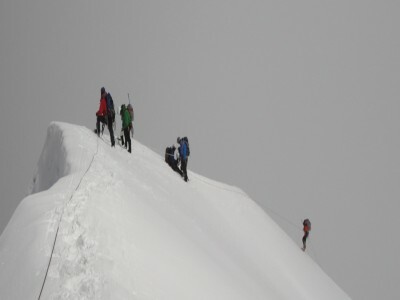 27 April/Day 09:Climb from base camp to High Camp (4,700m/15420ft. )-03hrs, overnight at camping accommodation. 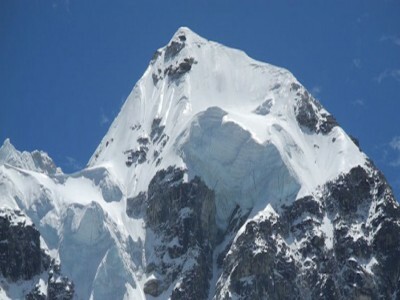 28 April/Day 10:Summit day of Mardi Himal (5,553m/18219ft.) and descend down to Low camp Low camp (3,150m/10335ft.). 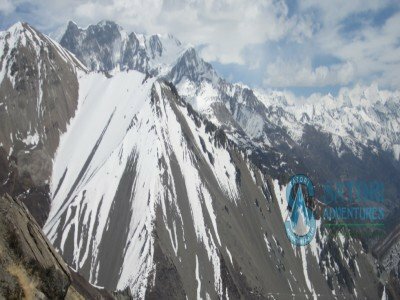 29 April/Day 11:Trek from Low camp to Forest camp (2,480m/8136ft. )-05hrs overnight at lodge accommodation. 30 April/Day 12:Trek from Forest camp to Australian camp (2300m/7546ft. )-04hrs, overnight at lodge accommodation. 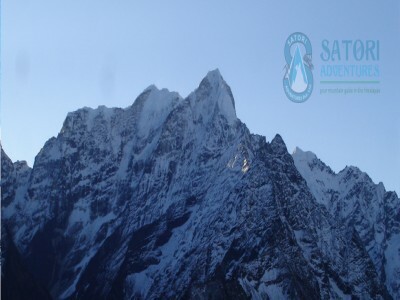 01 May/Day 13:Trek from Australian camp to Phedi (950m/3117ft. )- 03hrs. Drive to Pokhara, takes about 25 minutes. Overnight at Hotel. 02 May/Day 14: Drive from Pokhara to Kathmandu by tourist bus that takes about seven hours also you can take a flight which takes about 25 minutes, overnight at Hotel. Farewell dinner with culture program In the Evening. 03 May/Day 15: Drop to airport for final departure, or alternatively join other programs. 21 Oct/Day 02: Preparation and briefings at the departments of tourism. Last minute shopping. 22 Oct/Day 03: Drive or fly from Kathmandu to Pokhara (915m/3002ft.) which takes about seven hours by bus and 25 minutes by flight. Overnight at hotel accommodation. 23 Oct/Day 04: Drive from Pokhara to Khoramukh and Trek to Lwang (1100m/36081.ft)-01hhrs Drive and 02hrs trekking, lodge accommodation. 24 Oct/Day 05:Trek from Lwang to Siding (1,280m/4200ft,)-04 hrs lodge accommodation. 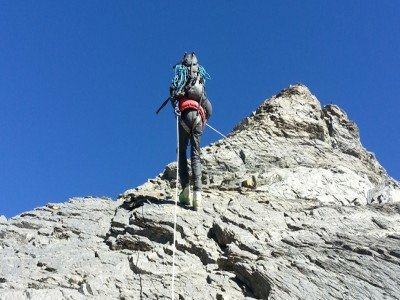 25 Oct/Day 06:Trek from Siding to Low camp (3,150m/10335ft. )- 04hrs Lodge accommodation. 26 Oct/Day 07: Rest and Acclimatization day before climbing above 4000m elevation. 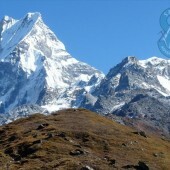 27 Oct/Day 08:Trek from Low camp to Mardi Himal Base camp (4,500m/14763ft)-04hrs overnight at camping accommodation. 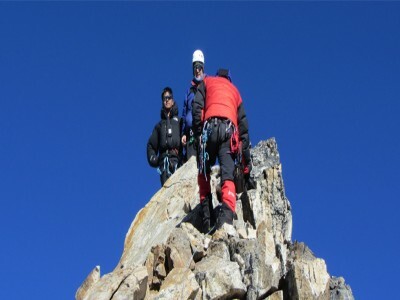 28 Oct/Day 09:Climb from base camp to High Camp (4,700m/15420ft. )-03hrs, overnight at camping accommodation. 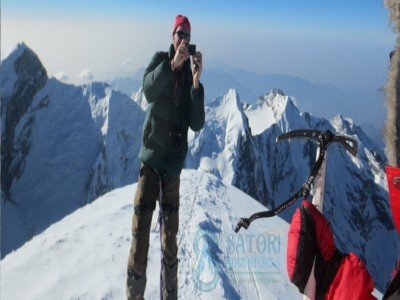 29 Oct/Day 10:Summit day of Mardi Himal (5,553m/18219ft.) and descend down to Low camp Low camp (3,150m/10335ft.). 30 Oct/Day 11:Trek from Low camp to Forest camp (2,480m/8136ft. )-05hrs overnight at lodge accommodation. 31 Oct/Day 12:Trek from Forest camp to Australian camp (2300m/7546ft. )-04hrs, overnight at lodge accommodation. 01 Nov/Day 13:Trek from Australian camp to Phedi (950m/3117ft. )- 03hrs. Drive to Pokhara, takes about 25 minutes. Overnight at Hotel. 02 Nov/Day 14: Drive from Pokhara to Kathmandu by tourist bus that takes about seven hours also you can take a flight which takes about 25 minutes, overnight at Hotel. Farewell dinner with culture program In the Evening. 03 Nov/Day 15: Drop to airport for final departure, or alternatively join other programs. Pokhara-Hemja and Phedi-Pokhara private car or jeep transportation as per group size. 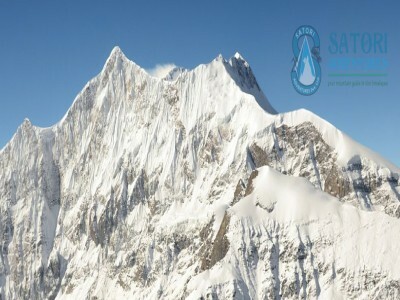 Expedition royalty and climbing permit of Nepal government to climb Mardi Himal(5553M/18219ft.) 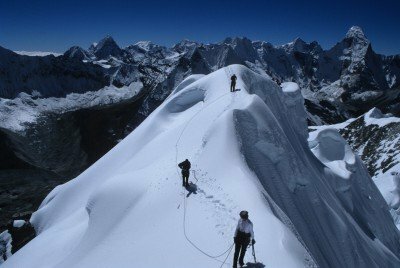 Peak Climbing..
Trekking and climbing map of Mardi Himal Peak Climbing. Lunch and Dinner during your stay in Kathmandu and Pokhara (except farewell dinner).